Glitter Gal has released a new collection of nine new incredible holographic shades for fall 2012 (spring 2012 in Australia 🙂 ). Have a look! Today I bring you the delicate beauty of Wisteria, a lavender, effervescent polish. Don’t let the delicateness of it fool you though, it is extremely holographic!! I experienced this with another Glitter Gal fave, Frappe, which, though delicate and light pink, was probably the most holographic polish I have ever purchased. This is such a demure and lady-like polish. As I applied it, I kept thinking how perfect it would be for a special event, such as attending a wedding or shower. Super pretty! And speaking of application, it applied really smoothly. I find Glitter Gal polishes to be on the thinner side, but not in a bad way. They apply really easily, and because the coats are thinner than other polishes, each coat also dried very quickly. I also adore the glass-like finish that Glitter Gal provides! It actually feels as smooth as glass. Three coats of Wisteria dried to a glossy finish before I had even applied a top coat! I did end up topping up with my favourite, China Glaze’s Fast Forward Top Coat, only because I like to make my manis last without chipping… but there really was no need. It was overcast and that’s exactly how it looked in the shade. A gorgeous, holo lavender even without any direct light. Love! I have no words for that crazy holo reflection. It was all I could do to type/get any work done with that beautiful distraction shining in my eyes…. This amazing brand was created in Australia by longtime friends Kerry and Anna, both with industry backgrounds, who decided to create a unique and premium makeup and nailpolish product line. Glitter Gal is Big 5-free (Camphor, TFR, DPB, Formaldehyde, and Toluene), cruelty-free, long-wearing and fast-drying, and provides this amazing true linear holographic finish that we love. 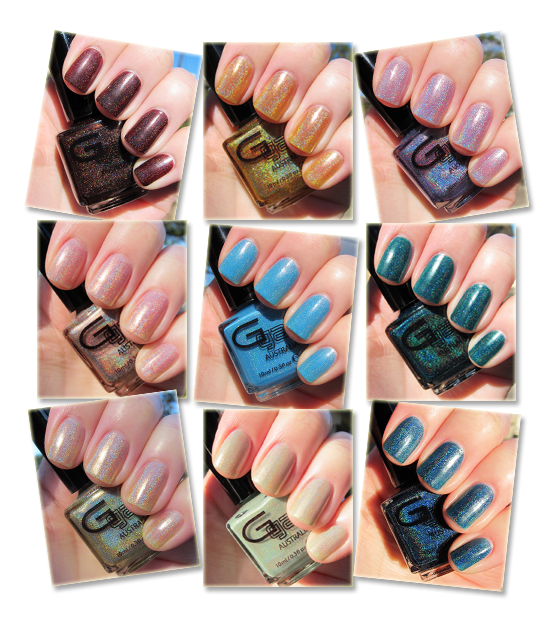 To get your very own, check out Glitter Gal’s online shop (they ship internationally! ), their Canadian stockist Harlow & Co, or check out the full list of stockists here! Glitter Gal is available in premium-boxed 15 ml bottles or the new, larger, 10 ml bottles that have replaced the old 9 ml smaller bottles (all thanks to customer feedback – how’s that for customer service!). Don’t forget to follow Glitter Gal on Twitter and Facebook for the latest news and exclusive giveaways! Do you own any Glitter Gal polishes?? If not… you NEED to own one. I mean, drop-what-you’re-doing-kind-of-need. Go online, and get yourself some holo love. Because Glitter Gal holos are insane. Wow, these are just awesome… Can’t wait for them to arrive in Finland!!!!! They really are! The holo on these is incredible!!! Also where can I get Glitter Gal polishes in Australia? I have to email you to get some sourcing information, would love some awesome Aussie brands in my collection would save me having to wait for my sis to go to the US! Re purchasing: if you click the link in this post, it’ll take you to Glitter Gal’s page, where you can either order online (which is probably so convenient for you if your in Aus!!) or find a retailer!!! You’re so lucky to have this brand so close to home, they’re amazing!